Review of Andrew S. Erickson, ed., Chinese Naval Shipbuilding: An Ambitious and Uncertain Course (Annapolis, MD: Naval Institute Press, 2016), Ausmarine (May/June 2017): 60. For nearly two centuries until recently, China went mostly backwards in terms of maritime activity. However, since around 2000, it has powered ahead to the point that it has become the world’s biggest shipbuilder; the owner of one of the largest cargo fleets; the biggest fishing nation; and a very big player in offshore oil and gas. In short, it has very rapidly become a very significant maritime nation. It is not surprising, then, that the United States’ defence establishment and, most particularly, its naval intelligentsia (and, no, this is not an oxymoron!) have begun to take a very close interest in Chinese matters maritime. This excellent and wide-ranging book represents a very strong expression of that interest. The papers included therein were presented at the China Maritime Studies Institute’s 2015 Annual Conference held in conjunction with the Naval War College. An influential pairing indeed. Taken together, the papers illustrate a very strong interest and knowledge of current Chinese naval affairs. As the possessor of the world’s mightiest navy for almost a century, the United States obviously has good reason to be very interested in its Chinese counterpart. Particularly so when the People’s Liberation Army Navy has risen so rapidly to the point that it is probably now the world’s second most powerful. The book makes it obvious that the next decade will be very important and probably exciting as far as US/China naval relations are concerned. Andrew S. Erickson, ed., Chinese Naval Shipbuilding: An Ambitious and Uncertain Course (Annapolis, MD: Naval Institute Press, 2016). 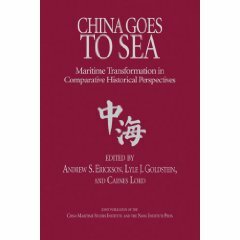 As with the previous five volumes in our “Studies in Chinese Maritime Development” series, an Amazon Kindle edition is available. Eventually, there will also be an authorized Chinese-language translation through Ocean Press, China’s leading maritime publisher! Author, “China’s Military Shipbuilding Industry Steams Ahead, On What Course?” 1-16. Coauthor, “Underpowered: Chinese Conventional and Nuclear Naval Power and Propulsion,” 238-48. One of this century’s most significant events, China’s maritime transformation is already making waves. Yet China’s course and its implications, including at sea, remain highly uncertain―triggering intense speculation and concern from many quarters and in many directions. It has never been more important to assess what ships China can supply its navy and other maritime forces with, today and in the future. China’s shipbuilding industry has grown more rapidly than any other in modern history. Commercial shipbuilding output jumped thirteen-fold from 2002-12. Beijing has largely met its goal of becoming the world’s largest shipbuilder by 2015. Yet progress is uneven, with military shipbuilding leading overall but with significant weakness in propulsion and electronics for military and civilian applications alike. Moreover, no other book has answered three pressing questions: What are China’s prospects for success in key areas of naval shipbuilding? What are the likely results for China’s navy? What are the implications for the U.S. Navy? To address these critical, complex issues, this volume brings together some of the world’s leading experts and linguistic analysts, often pairing them in research teams. These sailors, scholars, analysts, industry experts, and other professionals have commanded ships at sea, led shipbuilding programs ashore, toured Chinese vessels and production facilities, invested in Chinese shipyards and advised others in their investment, and analyzed and presented important data to top-level decision-makers in times of crisis. In synthesizing their collective insights, the book fills a key gap in our understanding of China, its shipbuilding, its navy, and what it all means. Their findings will fascinate and concern you. While offering different perspectives, they largely agree on several important points. Through a process of “imitative innovation,” China has been able to “leap frog” some naval development, engineering, and production steps and achieve tremendous cost and time savings by leveraging work done by the U.S. and other countries. China’s shipbuilding industry is poised to make the People’s Liberation Army Navy (PLAN) the second largest navy in the world by 2020, and―if current trends continue―a combat fleet that in overall order of battle (i.e., hardware-specific terms) is quantitatively and even perhaps qualitatively on a par with that of the U.S. Navy by 2030. Already, Chinese ship-design and -building advances are increasing the PLAN’s ability to contest sea control in a widening arc of the Western Pacific. China continues to lack transparency in important respects, but much is knowable through the interdisciplinary research approach pioneered by the Naval War College’s China Maritime Studies Institute in the series “Studies in Chinese Maritime Development,” of which this is the sixth volume. —Gregory Copley, “Essential Reading: Important New Strategic Literature,” Defense and Foreign Affairs Strategic Policy 2 (2017): 16. —Peter Hore, “China Reaches for Maritime Manifest Destiny,” Warships: International Fleet Review (April 2017): 47-48. —The Navy Magazine, Australian Navy League, 79.1 (January-March 2017). —Admiral Gary Roughead, USN (Ret. ), 29th Chief of Naval Operations, Forbes, 20 January 2017. —Michael DeBoer, Center for International Maritime Security (CIMSEC), 9 January 2017. Introduction. China’s Military Shipbuilding Industry Steams Ahead, On What Course? Daniel Alderman, a deputy director at Defense Group, Inc. (DGI), is Chinese language–proficient and oversees analytic production at DGI’s Center for Intelligence Research and Analysis. Eric Anderson, a Chinese-proficient research analyst, leads Sino-American sectoral innovation analysis at the University of California (UC), San Diego’s Study of Innovation and Technology in China (SITC) project. Jack Bianchi, a research associate at DGI, employs Chinese-language sources to analyze China’s defense-related science and technology development. Capt. Christopher P. Carlson, USNR (Ret. ), a submariner and intelligence officer, designs war games and has published a wide range of arti­cles and books. Arthur Chan, a research associate at RAND, is proficient in Chinese. Scott Cheney-Peters, a civil servant at the State Department and a Reserve surface warfare officer, is founder and president of the Center for International Maritime Security. Morgan Clemens, a research analyst at DGI, studies China’s armed forces and defense industry using Chinese-language sources. Gabe Collins, a licensed Texas attorney, conducts security, commodity, and market research in Chinese, Russian, and Spanish. Lt. Col. Cortez A. Cooper III, USA (Ret. ), is a Chinese language– proficient senior policy analyst at RAND and affiliate faculty member of Pardee RAND Graduate School. John Costello, a Chinese language–proficient U.S. Navy veteran with intelligence analysis and program management experience, is a research analyst at DGI. Rush Doshi, a Raymond Vernon fellow in Harvard University’s Ph.D. program in government, conducts research in Mandarin and Hindi. Ian Easton, a research fellow at the Project 2049 Institute, uses Chinese-language sources to analyze emerging Asian security issues. Capt. James E. Fanell, USN (Ret. ), a naval intelligence officer special­izing in Indo-Asia-Pacific security affairs for nearly three decades, runs the leading English-language listserv on Chinese military issues. Lt. Col. Robert T. Forte, USMC (Ret. ), formerly U.S. naval attaché at U.S. Embassy Beijing, is a senior research analyst with DGI. Sue Hall is managing director of Shipyard Economics, a firm providing spe­cialist consulting services in the shipbuilding, ship repair, and shipyard indus­tries worldwide. Tyler Jost, a Chinese language–proficient former Army intelligence officer, is a Ph.D. student in Harvard University’s Government program. Rear Adm. Michael McDevitt, USN (Ret. ), an analyst of China’s maritime developments, formerly carrier battle group commander and com­mandant of the National War College, is presently a senior fellow at the CNA Corporation. Rear Adm. Michael E. McMahon, USN (Ret. ), a senior research associate at RAND with a Ph.D. in mechanical engineering, served as the U.S. Navy’s fifth program executive officer for aircraft carriers. Cdr. Mark Metcalf, USN (Ret. ), a surface warfare officer and naval cryptologist, provides systems engineering and Chinese-language research, translation, and technical analysis support to government clients. Tate Nurkin is senior director of the Strategic Assessments and Futures Studies Center for IHS Aerospace, Defense, and Security. Sean O’Connor is the principal imagery analyst at IHS Jane’s. Ronald O’Rourke, a naval analyst for the Congressional Research Service of the Library of Congress, issues constantly updated reports on China’s navy. Alex Pape is a principal analyst with IHS Jane’s DS Forecast and Defence Procurement, which provide real-time coverage of procurement and upgrade programs worldwide. Kevin Pollpeter, a Chinese language–proficient senior research scientist at CNA, has also served as deputy director of technically focused research programs at both UC San Diego and DGI. Leigh Ann Ragland-Luce, a research analyst at DGI, conducts Chinese-language research on China’s defense electronics and information technology sectors. Jonathan Ray, a DGI research associate, conducts Chinese-language stud­ies of national security, science, and technology issues. Paul Scharre, a former infantryman in the Army’s 75th Ranger Regiment with multiple tours in Iraq and Afghanistan, is a senior fellow and director of the 20YY Future of Warfare Initiative at the Center for a New American Security. Andrew Scobell, proficient in Chinese, is a senior political scientist at RAND and adjunct professor of Asian studies at Georgetown’s School of Foreign Service. Julian Snelder, a partner in a global investments fund, has conducted investment research from Asia for nearly a quarter-century. Lt. Col. Mark Stokes, USAF (Ret. ), the Chinese-proficient executive director of the Project 2049 Institute, formerly served as assistant air attaché at U.S. Embassy Beijing. Audrye Wong, fluent in Chinese, is a Ph.D. student in Security Studies at Princeton’s Woodrow Wilson School of Public and International Affairs. Jordan Wilson is a policy analyst at the U.S.-China Economic and Security Review Commission, where he conducts Chinese-language research. Andrew S. Erickson, a U.S. Naval War College Professor of Strategy and associate-in-research at Harvard University’s Fairbank Center for Chinese Studies who is proficient in Chinese, blogs at www.andrewerickson.com. On behalf of the China Maritime Studies Institute (CMSI), the editor thanks the Naval War College (NWC) Foundation for its important contribu­tions in support of CMSI’s 2015 annual conference and this resulting volume. The foundation’s generosity has long played a crucial role in ensuring that such events and the publications that flow from them are of the highest caliber, and this past year has offered a particularly important example of that invaluable partnership. As with all CMSI events and conference volumes, countless individuals have made vital contributions. While it is not possible to list them individu­ally, the editor extends his sincere gratitude to all concerned. The support of the leadership of NWC, and of the U.S. Navy more broadly, has been crucial to our efforts. Finally, the Naval Institute Press is to be commended for its profession­alism and dedication to the Studies in Chinese Maritime Development series in which this sixth volume appears. That series is the product of nearly a decade of constructive collaboration between two vital historic centers of American thinking on sea power: Annapolis and Newport. Powered by the world’s second largest economy and defense budget, China is going to sea with a scale and sophistication that no continental power ever before sustained in the modern era. Its three sea forces are all leaders in their own right: the world’s second-largest blue water navy, the world’s largest blue water coast guard, and the world’s largest (and virtually only) maritime militia. While paramount leader Xi Jinping is working to transform his nation further into a “great maritime power,” at a minimum today’s Middle Kingdom is already a hybrid land-sea power. Amid European decline and American fiscal and strate­gic challenges, this historic transformation has the potential to end six centuries of largely Western dominance of the world’s oceans. To properly inform its strategy and policy, the U.S. Navy and nation must understand this momentous sea change. Since its establishment in 2006 the China Maritime Studies Institute has been conducting research and holding conferences covering the broad waterfront of Chinese oceanic efforts in order to advise U.S. Navy leadership and support the Naval War College in its core mission area of helping to define the future Navy. The Studies in Chinese Maritime Development series assembles the resulting pro­ceedings into edited volumes focusing on specific topics of importance to further understand the dynamics of these changes. Andrew S. Erickson, “China’s Naval Shipbuilding Sets Sail,” The National Interest, 8 February 2017. China has parlayed the world’s second-largest economy and second-largest defense budget into the world’s largest ongoing comprehensive naval buildup, which has already yielded the world’s second-largest navy. All that is only part of an extraordinary maritime transformation—modern history’s sole example of a land power becoming a hybrid land-sea power on a sustained basis. Underwriting this transition are a vast network of ports, shipping lines and financial systems, and increasingly advanced ships. It also raises the rare prospect of a top-tier non-Western sea power in peacetime, one of the few instances to occur since the Ming Dynasty developed cutting-edge nautical technologies and briefly projected unrivaled power across the Indian Ocean six centuries ago. These factors raise a critical question for our age: Where is China headed at sea, and to what end? Ships are the physical embodiment of naval strategy and an essential element through which a nation achieves the ends of maritime strategy. China has three major sea forces: the navy, coast guard and maritime militia. Of them, the navy is China’s primary force beyond the near seas (such as the Yellow, East China and South China Seas) as well as the critical measure of its sophistication in shipbuilding. Yet, unlike every other major shipbuilding power, China does not reveal how many warships of each class it intends to build. What are China’s prospects for success in key areas of naval shipbuilding? What are the likely results for China’s navy? Review of Andrew S. Erickson, ed., Chinese Naval Shipbuilding: An Ambitious and Uncertain Course (Annapolis, MD: Naval Institute Press, 2016); The Navy Magazine, Australian Navy League, 79.1 (January-March 2017). This is an important, timely and indeed ambitious book at a pivotal moment in World history. In understanding China’s Shipbuilding and Designs one also gains a glimpse into the cultural knowledge, technologies and enduring artefacts necessary to sustain a Navy. It was no accident that the Industrial Revolution had at its core the impetus given by the need to rebuild the Royal British Navy following the Civil Wars; the 1688 Golden Takeover (by the Dutch); the financial crises of the 1690s; and, the 1707 Act of Union. Ship designs, builds and manufacturing that defined British Navy and Industry for the next 300 years. The enduring nature of both the revolution and the Navy also shaped new means of working and organising resources (Admiralty); new financial models (based upon The Bank of England and the City of London), and significantly impacted the mass movement of peoples across the world – exacerbated by the Irish Potato famine and the Highland Clearances. An industrial revolution of this type could not therefore be sustained without impacting society and the work force (for example the Great Leap Forward that killed millions); which similarly impacted the designs and builds of ships and democratic political organisations alike. For example, the rise of the Unions; the Labour movement, and Sinn Fein (in Ireland). Michael DeBoer; review of Andrew S. Erickson, ed., Chinese Naval Shipbuilding: An Ambitious and Uncertain Course (Annapolis, MD: Naval Institute Press, 2016); Center for International Maritime Security (CIMSEC), 9 January 2017. Chinese Naval Shipbuilding Capability: An Uncertain Course adds the most recent volume to Dr. Andrew Erickson’s excellent edited collections on the increase of the People’s Republic’s military, economic, and industrial power published by the Naval Institute Press. Erickson’s credentials include a professorship in strategy at the Naval War College, a research associateship at Harvard’s Fairbank Center for Chinese Studies, and [serving as] a regular congressional witness on areas pertaining to Chinese capabilities and strategy. He is a giant in the field. The work combines seventeen articles written by thirty-two authors, among them storied names such as CRS naval analyst Ronald O’Rourke and former former Director of Intelligence and Information Operations (N2) for U.S. Pacific Fleet CAPT James Fanell (ret). The volume provides a nuanced and insightful view of a major Chinese strategic investment, its shipbuilding industry, and is required reading for anyone, academic or layman, trying to understand the associated capabilities and implications of the People’s Republic’s maritime rise. 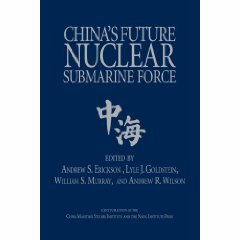 The three hundred-forty-page tome is broken into five sections, describing the PRC’s shipbuilding industry’s foundation and resources, infrastructure, approach to naval architecture and design, remaining challenges, and a section which provides strategic conclusions and predictions for the future of American naval and maritime power. The articles are easily readable, each approximately ten to fifteen pages of crisp, synthesized content, with end notes allowing readers to further explore the author’s research, although most references are translated from Mandarin Chinese. The works also feature multiple graphs, tables, and illustrations, providing further resources for students and researchers. While each article provides fascinating insights into the past, present, and future of Chinese shipbuilding, four areas of study especially stood out as enjoyable, informative, and useful. First, Christopher P. Carlson and Jack Bianchi’s Chapter I review of the People’s Republic’s naval and maritime history from the formation of the communist state to Xi Jinping provides a concise review of the People’s Liberation Army Navy’s (PLAN) strategic development. Carlson and Bianchi first review the PLAN’s operational shift from Near Coast Defense, to Near Seas Active Defense, and finally to Near Seas Defense and Far Seas Operations, as the PLAN’s resources, capabilities, and objectives adapted to match the nation’s goals. The pair provide an excellent linkage between China’s strategic situation since Mao’s victory and the requirements of PLAN platforms as the force shifted from a coastal force to a limited blue water force and finally to a force intended to defend Chinese interests on both the near and far seas. This evolution brought an increase in the complexity and technical sophistication to the Chinese military shipbuilding industry. Second, Leigh Ann Ragland-Luce and John Costello provide insight into a major limitation of Chinese military shipbuilding: combat electronics. Ragland-Luce and Costello point out that, while PLAN hull and mechanical systems are regularly manufactured using modern industry standards such as modular construction, the PLAN remains unable to field a top-tier indigenously developed combat control system. The authors use the Jiangkai-II (054A)-class guided missile frigate, a modern warship by any standard, whose combat control system (CCS) is based upon the French TAVITAC, vice a comparable Chinese design. This potential lack of integration between the French CCS and developing Chinese weapons and sensor systems might well prove a combat handicap for PLAN forces in future conflicts. 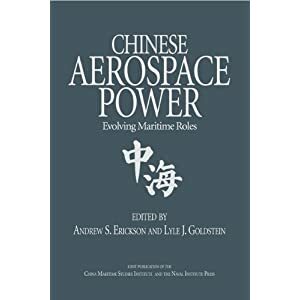 Similarly, editor Andrew Erickson with Jonathan Ray and Robert T. Forte provide an excellent dissertation on the limitations of Chinese propulsion plant designs. According to the trio, the PLAN appears proficient in coastal diesel submarine propulsion technologies. The PLAN effectively integrates Sterling Engine Air Independent Propulsion (AIP) systems into its Yuan-class diesel-electric boats (SSPs), and it leads research into safe Lithium-Ion battery storage systems, potentially increasing coastal submarine endurance. It still lags considerably in both modern integrated surface propulsion plants and nuclear powered propulsion designs. Third, the work uses present shipbuilding capacity to extrapolate future PLAN capability and force structure. CAPT James Fanell (ret) and Scott Cheney-Peters (Founder of CIMSEC) provide a realistic warning regarding the long-term challenge of Chinese strategic depth in military shipbuilding. Ronald O’Rourke caps the work with a set of implications for the U.S. Navy if PLAN force structure continues to expand. Overall, Chinese Naval Shipbuilding provides a very useful window into an area of intense Communist Party strategic investment. The work gives the reader an excellent overview of the industry as a whole, overlapped with strategic context and geopolitical implications. As discussed, the volume also provides a unique look at the industry’s challenges, including increased engineering costs, poor integration with modern combat systems, and challenges in surface ship engineering plants and nuclear propulsion technologies. Nuanced and complex, it describes both the accomplishments of an industry that now leads the world in commercial tonnage produced, but also lags behind in critical areas mastered by much smaller and less-rich nations. Erickson’s volume is a worthy addition to his series and an enjoyable read. Read CIMSEC’s interview with editor Dr. Andrew Erickson on this book here. Shannon Tiezzi, “Chinese Naval Shipbuilding: Measuring the Waves—An interview with Andrew S. Erickson,” The Diplomat, 25 April 2017. After a six-century hiatus, sea power development may once again find its center of gravity in the Asia-Pacific. While the Trump Administration plans a naval buildup, China is already well into a buildup of its own. A new book from Naval Institute Press explains why Beijing is making such waves, how big they are, and how great they might become. To learn more, The Diplomat’s Editor-in-Chief Shannon Tiezzi interviewed Naval War College professor Andrew S. Erickson, the editor of Chinese Naval Shipbuilding. That’s right! It’s the product of two great historic centers of American thinking on seapower: Newport and Annapolis. Here’s why we collaborated on this book: China’s maritime transformation is already making major waves. It’s not just one of this century’s most significant events, but part of an even greater sea change: for the first time in 600 years, sea power development may be flowing away from the Euro-Atlantic shipyards of the West. For the first time in nearly two millennia, it may be flowing toward a longtime land power that’s going seaward to stay. As Chinese mandarins and mariners chart their country’s new course, specificity is often scarce — yet ships are no abstraction. For all these reasons, it’s never been more important to assess what ships China can supply its navy and other sea forces with, today and tomorrow. From a Newport-based perspective, in particular, this raises three pressing questions: What are China’s prospects for success in key areas of naval shipbuilding? What are the likely results for China’s navy? What does this mean for the U.S. Navy (USN)? To answer these questions, we assembled some of the world’s leading experts and linguistic analysts. Our contributors include sailors, scholars, and industry experts. They’ve commanded ships at sea, led naval programs ashore, seasoned intelligence analysts, toured Chinese vessels, invested in Chinese shipyards, and briefed leaders facing urgent national security decisions. China continues to lack transparency in important respects, but much has been revealed through such interdisciplinary analysis — a hallmark of CMSI efforts. 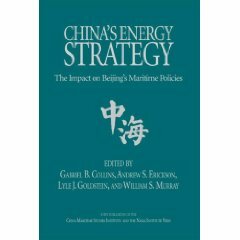 Accordingly, our contributors assess the impact of Beijing’s substantial economic resources, growing maritime focus, and uneven but improving defense industrial base on its prospects for success in key areas of naval shipbuilding; the likely results for China’s sea forces, particularly its navy; and the implications for the USN. The first section surveys the foundation and resources for China’s naval shipbuilding, providing an overall framework. The next three sections examine specialized subsets of China’s shipbuilding program: infrastructure, architecture and design, and impediments. Section two, on shipyard infrastructure, surveys China’s vessel construction facilities and their production and evolution. The third section covers Chinese naval architecture and design, from standards to production processes to civil-military disparities, and Beijing’s prospects for narrowing them through its preferred centralized approach. Section four addresses remaining shipbuilding challenges for China. The final section returns to the strategic level by offering alternative futures, conclusions, and takeaways. How close is China’s navy to challenging America’s as the world’s largest (in numbers) and strongest (in capabilities)? China’s shipbuilding industry is poised to make the People’s Liberation Army Navy (PLAN) the world’s second largest navy by 2020, and — if current trends continue — a combat fleet that in overall order of battle (i.e., hardware-specific terms) is quantitatively and even perhaps qualitatively on a par with that of the USN by 2030. Sally DeBoer, President, Center for International Maritime Security (CIMSEC), “A Conversation with Dr. Andrew Erickson on Chinese Naval Shipbuilding,” 19 December 2016. On the occasion of the publication of his newest book, Chinese Naval Shipbuilding: An Ambitious and Uncertain Course, the 6th volume in the USNI Press’ Studies in Chinese Maritime Development Series, CIMSEC spoke with editor and author Dr. Andrew Erickson, Professor of Strategy in, and a core founding member of, the U.S. Naval War College (NWC)’s China Maritime Studies Institute (CMSI). SD: Dr. Erickson, thank you so much for joining CIMSEC to talk about your new book, Chinese Naval Shipbuilding. This topic is of great interest to our readership, and your book is perhaps the most comprehensive, detailed, and up-to-date look at the growth, and specifically the methods and implications of that growth, of the People’s Liberation Army – Navy (PLAN). To begin, can you tell us a bit about yourself and what brought you to this topic? AE: In twelve years in Newport, I’ve been privileged to help establish the U.S. Navy (USN)’s China Maritime Studies Institute (CMSI) and turn it into a recognized research center that has inspired both the Air Force’s China Aerospace Studies Institute and the Naval War College’s Russia Maritime Studies Institute. In my own analysis, I’ve explored new areas of Chinese-language methodology and worked to develop new concepts and findings that can enhance U.S. understanding of, and policies toward, China. With the support of CMSI’s current director, Professor Peter Dutton, I have recently applied our Institute’s resources to examining the industrial underpinnings of one of this century’s most significant events, China’s maritime transformation. Strong strategic demand signals and guidance from civilian authorities, combined with solid shipbuilding industry capability, are already driving rapid progress. Yet China’s course and its implications, including at sea, remain highly uncertain—triggering intense speculation and concern from many quarters and in many directions. Moreover, despite these important dynamics, no book had previously focused on this topic and addressed it from a USN perspective. Like the CMSI conference on which it is based, the resulting volume in our series with the Naval Institute Press, “Studies in Chinese Maritime Development,” focuses some of the world’s leading experts and analysts on addressing several crucial questions of paramount importance to the USN and senior decision makers: To what extent, and to what end, is China going to sea? What are China’s prospects for success in key areas of naval shipbuilding? What are the likely results for China’s navy? What are the implications for the USN? SD: Part One of the text deals with Foundations and Resources, meaning the foundations of China’s shipbuilding industry and the assets supporting its efforts. The first chapter, in fact, explores how the evolution of China’s maritime strategy impacts future ship design. From your perspective, what primary mission needs will drive Chinese shipbuilding over the next quarter century, and what effect will that have on the fleet? AE: China’s primary focus remains upholding its interests and promoting its disputed claims in the “Near Seas”—which encompass the waters within the First Island Chain (the Yellow Sea, East China Sea, and South China Sea)—as well as defending their immediate approaches. It also has a growing desire to increase operational capability in the “Far Seas”—beyond the First Island Chain. This is essentially about being able to project power. First, to improve the defense of China itself; and second, to defend China’s growing economic interests abroad, which largely depend on unfettered access to the sea. Andrew S. Erickson, “Steaming Ahead, Course Uncertain: China’s Military Shipbuilding Industry,” The National Interest, 19 May 2016. “In recent years, China’s navy has been launching new ships like dumping dumplings [into soup broth].” This phrase has circulated widely via Chinese media sources and websites. Accompanying it are ever-more-impressive analyses and photographs, most recently of China’s first indigenous aircraft carrier, now under construction in Dalian. The driving force behind all this, China’s shipbuilding industry, has grown more rapidly than any other in modern history. One of this century’s most significant events, China’s maritime transformation is already making waves. Still, however, China’s course and its implications—including at sea—remain highly uncertain, triggering intense speculation and concern from many quarters and in many directions. Beijing has largely met its goal of becoming the world’s largest shipbuilder. Yet progress remains uneven, with military shipbuilding leading overall but with significant weakness in propulsion and electronics for military and civilian applications alike. It has thus never been more important to assess what quality and quantity of ships is China able to supply its navy and other maritime forces with, today and in the future. Somewhat surprisingly, however, there has been insufficient attention to this topic, particularly from a U.S. Navy (USN) perspective. To bridge that gap, a diverse group of some of the world’s leading sailors, scholars, analysts, industry experts, and other professionals convened at the Naval War College (NWC) on 19-20 May 2015 for a two-day conference on “China’s Naval Shipbuilding: Progress and Challenges.” Hosted by NWC’s China Maritime Studies Institute (CMSI), it was cosponsored with the U.S. Naval Institute (USNI), which will publish the resulting edited volume early next year. CMSI was formally established on 1 October 2006. Its research and analysis of China’s maritime capabilities helps to inform USN leadership and supports NWC in its core mission area of helping to define the future Navy. The annual CMSI conference is a principal function of the Institute, supporting focused examination of the full range of Chinese maritime developments. – What are China’s prospects for success in key areas of naval shipbuilding? – What are the likely results for China’s navy? – What are the implications for the USN? As the self-designated target yearfor China to become the world’s largest shipbuilder, 2015 was a particularly appropriate time for the conference. In some respects, China has already accomplished its goal, yet major problems and uncertainties remain as we look forward over the next fifteen years through 2030—the rough timeframe for this conference’s analysis. Over one hundred and fifty attendees participated in CMSI’s conference. They hailed from such institutions as Harvard, Yale, Princeton, MIT, Johns Hopkins, University of California, and Virginia Tech; together with such organizations as the Congressional Research Service, RAND Corporation, National Bureau of Asian Research, IHS Jane’s, China SignPost, and commercial enterprises and consultancies; as well as such USN entities as the Office of Naval Research, the staff of the Chief of Naval Operations, and the Pacific Command and Pacific Fleet. There were also distinguished attendees from the navies and governments of such important U.S. allies as Japan, South Korea, Canada, the United Kingdom, and France.